SuperMask is the first mask successfully designed to stay on stabled or pastured horses. Patented, "no vision obstruction" design protects eyes from fly irritation, disease, flying dust, dirt and debris. Speeds healing after eye injury. Provides 70% shade for sun-sensitive eyes. 2000 denier "Rip-Block"™ makes SuperMask more durable than ever. So durable, SuperMask often lasts more than one season. Heavy duty mesh fly shield, sun screen and blanket protector all in one with contoured rump for better fit, UV protection, fleece withers protector, durable web adjustable leg straps with EZ swivel snaps, open front styling with double grommet & strap closure, &adjustable belly surcingle. Use alone or over another sheet/blanket as a protective sheet. Hose cleaned but still has surface dirt/stains, some rust on buckles/hardware & 1 tiny pencil eraser sized hole on left flank. Double grommet holes in front allow for a variety of fitting options, so this will fit a 78” - 80” easily & could possibly fit an 82” if you didn't close up the front as much. Only 1 front strap, other is missing, but easy to add an old English spur strap, cat collar, baling twine, etc. Not tagged as to maker, tagged a size 81. Similar in quality to Kensington, Farnam, etc. SuperMask is the first mask successfully designed to stay on stabled or pastured horses. Patented, "no vision obstruction" design protects eyes from fly irritation, disease, flying dust, dirt and debris. Speeds healing after eye injury. Provides 70% shade for sun-sensitive eyes. 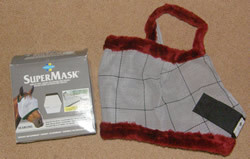 2000 denier "Rip-Block"™ makes SuperMask more durable than ever. So durable, SuperMask often lasts more than one season. 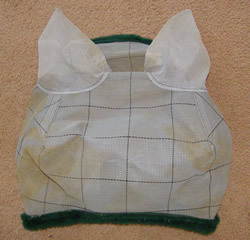 This mask has ears for more complete protection. Small repaired hole in right ear mesh, no stains, minor hairs on underside of fleece around nose. SuperMask is the first mask successfully designed to stay on stabled or pastured horses. Patented, "no vision obstruction" design protects eyes from fly irritation, disease, flying dust, dirt and debris. Speeds healing after eye injury. Provides 70% shade for sun-sensitive eyes. 2000 denier "Rip-Block" makes SuperMask more durable than ever. So durable, SuperMask often lasts more than one season. This mask has ears for more complete protection. Clean but some stains. The Roma Soft Mesh Fly Mask is made from a soft yet very strong mesh outer, which is soft & easy on your horses face while still strong enough to retain its shape very well & avoid irritation on the eyes & face.Great for gnats & no see 'ums. Machine washable. Tagged size Cob. 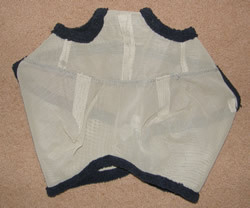 Clean with no debris in fleece nor holes in mesh. This revolutionary sheet offers maximum year-round protection. Manufactured of US made 1000 x 2000 Denier Textilene fabric, which is specially formulated to withstand fading, fire, mildew, soiling & wear and tear, even in the most extreme weather conditions. 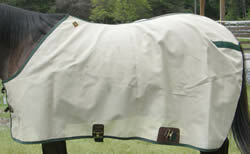 This mesh keeps harmful UV rays, dirt and grime away keeping your horse cleaner, drier and warmer. This sheet can be used to layer over Kensington turnouts to increase life of the turnout as well as to keep the snow directly off the waterproof blanket, giving a long life expectancy to your blanket. Designed with a single belly strap, detachable elastic leg straps and a contoured fit. This sheet is Fly Proof, UV Resistant, Durable, Air Permeable, Soil Resistant, offers Wound Protection, is Fire Retardant, Mildew Resistant, Fade Resistant, and is made of Self Grooming Mesh. Hose off and air dry. Adjustable surcingle and buckle closure at belly. Use alone or over another sheet/blanket as a protective sheet. 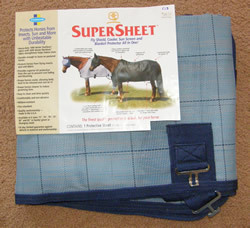 SuperMask is the first mask successfully designed to stay on stabled or pastured horses. Patented, "no vision obstruction" design protects eyes from fly irritation, disease, flying dust, dirt and debris. Speeds healing after eye injury. Provides 70% shade for sun-sensitive eyes. 2000 denier "Rip-Block"™ makes SuperMask more durable than ever. So durable, SuperMask often lasts more than one season. Clean, excellent used condition, horses name written on 1 side. Cooler style fly sheet in lightweight mesh open weave fabric, breathes to help keep your horse cool, aids evaporation and keeps insects away. 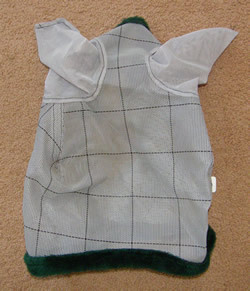 Perfect cover for shows-keeps horse's coat clean and protected after grooming, while tacked or untacked. Full 94" length to cover horse from head to tail. Brow strap, tie strings & fleece covered tail cord. Approx 94x94”. Few small holes/snags, same holes on both sides, so done while Not on horse. This is a safe alternative to toxic fly sprays. The unique patented design of the Cavallo Ride Free Fly Mask protects your horse against flies, insects, dust, and debris. Velcro straps attach the mask easily securely and safely to your headstall or bridle & allows your horse to see clearly without impairing his vision on the trail. Exceptionally transparent, durable & comfortable. Offers UV protection & is simple to put on or remove.